Party to end all Parties. I landed in Havana the day Big Raúl relinquished the Cuban presidency, ending the 59-year long Castro dynasty that managed to survive an American blockade, the collapse of their economic mainstay, and apparently 600+ assassination attempts. The western media were calling the occasion “enormous”. The people of Havana seemed not to have noticed. Life and the living of it was the priority today as with any other day. There was work to be done, there was rum to be drunk, there was romance to be pursued. The sun was about to start setting as I stepped out of my casa particular in Havana Vieja, and here that means one thing. You go to the Malecón. At some point in the late 40s Havana was hailed as the sexiest city in the world. A lot has undeniably changed since then. We’re in flux here, the country is becoming porous and western modernities are seeping in; things as unsexy as public wifi and BMWs and two cruise ships a week from Florida. Still though, it’s probably the easiest place in the world to get some. Whatever “some” is to you: your photo taken and an over-the-shoulder smile; a spontaneous 15-minute conversation about the absurdity of snow; mojitos with a big-armed stranger at a rooftop rumba bar; a moonlit massage on the sea wall; or… whatever. 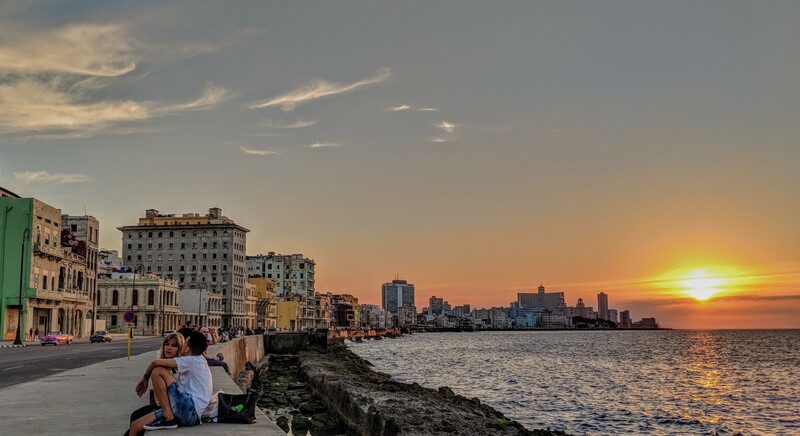 More specifically, the Malecón is your Mecca for getting it – a five mile, sea-fringed magnet for lovers of all generations. Habaneros come here to date, to woo, to propose, to pick up tourists. You don’t have to seek it out, it will come to you. But if you don’t want it, no problem. You just gotta get used to saying No. Long after the sun has set, the Couples Scene gives way to something altogether more frivolous – the Havana Youth Impromptu Dance Party Scene, where the adolescents of the city gather in clusters with bottles of rum, a few litres of coke and a portable speaker, mixing themselves Cuba Libres and dancing until who knows when. I don’t cause I went back to my casa while it was still very much in swing. Taking it easy on the first day and all… although definitely not leaving unsatisfied. The next morning I had breakfast at La Vitrola on the corner of Plaza Vieja and it was about as strange as it gets. Roasted vegetables (90% cabbage and grated carrot), savoury crepes and a bisected frankfurter covered in melted cheese, served with maple syrup. More surprising than the actual combination was the fact that it was good. It’s got all the food groups, it’s got that sweet and salty thing going on, it came with some strong coffee and a pineapple juice. And the people watching from where I was sitting was first class. If you’re into people watching, you’re going to love Havana. I discovered early on that quite possibly the best thing to do in Havana is to just wander around doing nothing much at all other than observing what’s going on around you, looking at everyday things that are unlike the everyday things you’ve seen anywhere else. 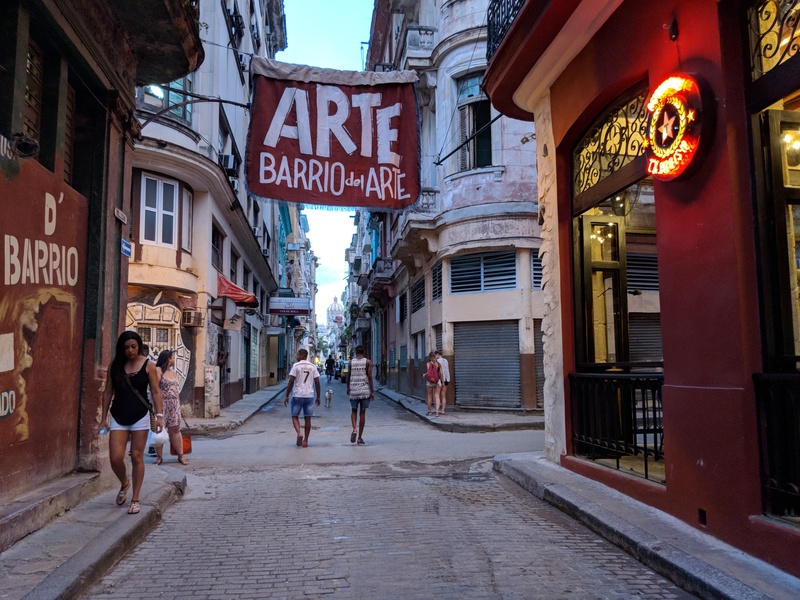 Don’t worry about ticking things off on your bucket list – to absorb the city through prolonged sensory osmosis is to truly experience Havana and everything else in your guidebook is mere embellishment. Full immersion is made easier by the real city smells you get in the back streets. Rotting trash with hints of rum and the occasional blast of cooking meat. Sure, you wouldn’t want your living room smelling like that but it’s kind of gross in the best possible way. These streets seem to be where the people of Havana get on with pretty much everything. They’re hanging out, sitting, painting, selling fruit, eating lunch, skateboarding, closing business deals, feeding dogs, smoking cigars, sanding wood, playing music, polishing their shoes, drinking cola, chatting to people in cars, dancing, playing chess – right on the street. You can witness people carrying out their day-to-day mundanities without peering through their windows or breaking into their houses. From Plaza Vieja I wandered not-quite-aimlessly along to the harbour where, in the 1500s, Spanish galleons used to dock but now it’s mostly cruise ships releasing swathes of excited passengers into the city. 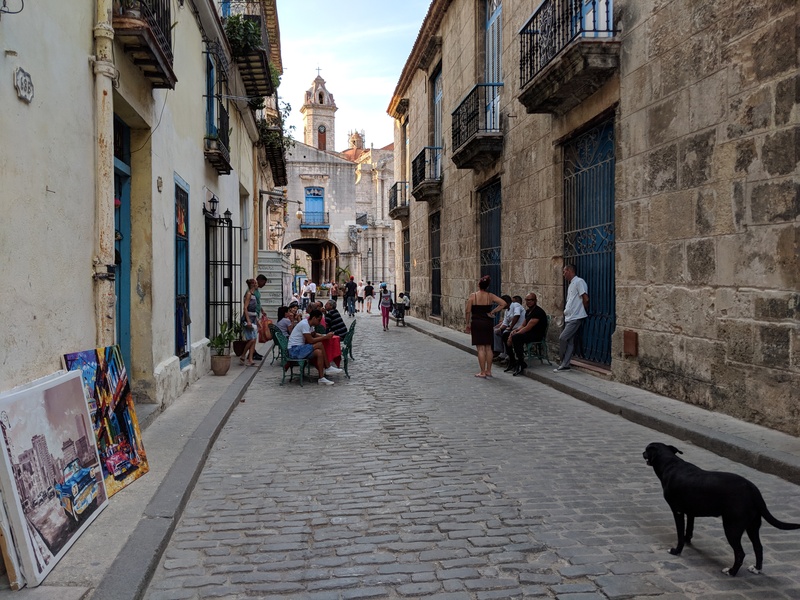 I took a look at the Havana Club rum museum, then back into the centre of Havana Vieja via the beautifully restored and fabulously cobbled Plaza San Francisco. Back in the warren, live music drew me into a bar called Cafe Paris, where I had my first Cuba Libre (rum and coke to everyone else) of the trip and planned the rest of the day. I decided I wanted to go to Plaza de la Revolución, and I decided to take a taxi. 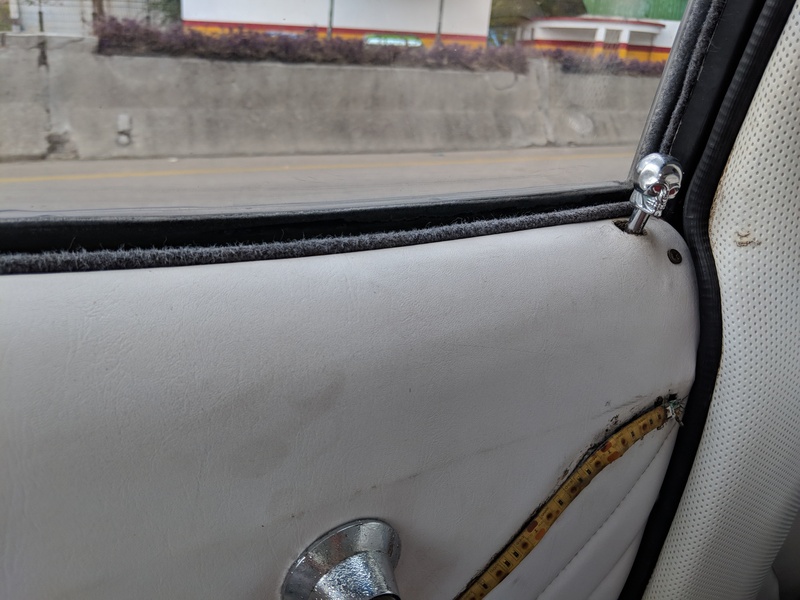 Happily in Havana there’s a good chance your taxi will be a pink 1951 Chevy convertible with a hilarious driver, turning your necessary ride into the best 15 minutes of your life. Plaza de la Revolución itself is kind of a must-see yet ok-that’s-enough type attraction. It’s iconic, you’ve seen it on TV, the history is important. But 3 minutes in, you’re wishing you were back in the beehive of Havana Vieja being propositioned by locals and breathing in the particulate matter from seventy year-old diesel engines idling in narrow streets. So after I snapped a couple of photos I was back doing what I like to do best. And Havana has some different vibes in the evening. It’s quieter, the fading daylight is great for photography – you can make out more of the detail on the faded, peeling facades when they’re not being washed out by the dazzling Caribbean sun. People are more relaxed. The day’s frantic toil is over and the rest of the evening is about eating, drinking and romancing. 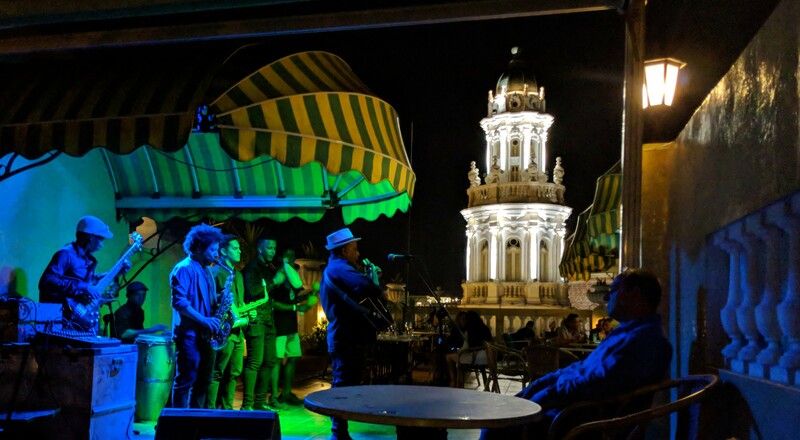 What’s fun to do at night is to grab a mojito with somebody you’ve just met on the rooftop terrace of Cuba’s oldest hotel, and he can try and fail to teach you how to dance Salsa. Cubans are born with rhythm. Scottish people are generally not. A good time was had by all. 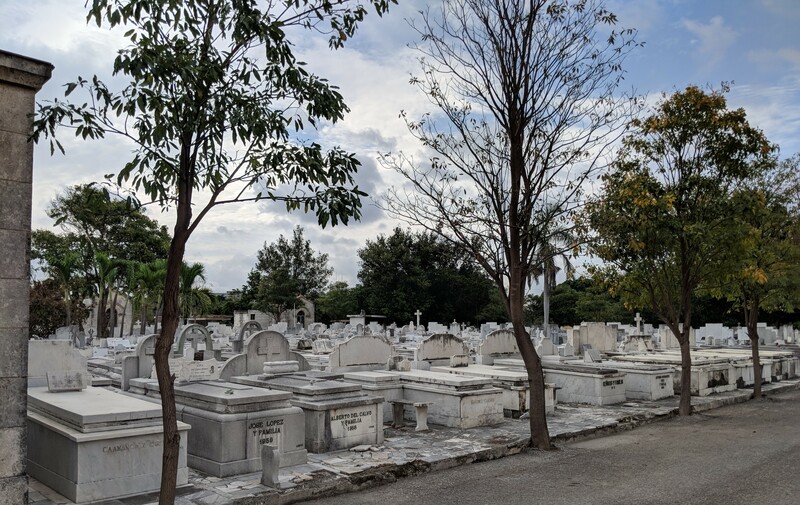 The next morning I decided to satisfy my morbid side and took a stroll out to Vedado where Cementerio de Cristóbal Colón is. If you’re into places where they put dead people, this, being one of the most historically and architecturally important cemeteries in the world, is not one to be missed. 140 acres of elaborate mausoleums, above-ground sarcophagi and all-round death-based goodness, come at me! I took the most direct route back to Havana Vieja – down Avenida Salvador Allende, past Parque de la Santa Varela and Iglesia Del Sagrado Corazon de Jesus, and then down the bustling Avenida Simón Bolívar. It was about 35C and I regretted doing this very long walk on foot after about 20 minutes, but I’ve found in Havana that you’re offered a taxi every 5 minutes until you actually want one and then there are none. Never mind… at least there are nice things to look at. Finally almost back where I want to be. 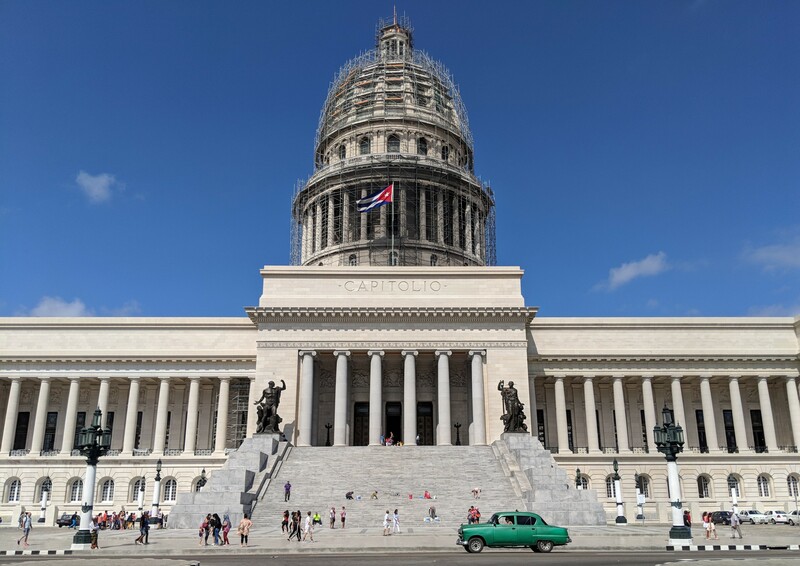 On the fringe of Havana Vieja is El Capitolio, which currently houses the Cuban Academy of Sciences, but is in the middle of being restored so that it can once again be used for the National Assembly. Not far from el Capitolio is one of the places i’m most excited to go. El Floridita. The home of the daiquiri, and favourite watering hole of Ernest Hemingway, who famously once drank sixteen of the double rum, no sugar variety in a single sitting (the house record). I was expecting this place to be rammed like Hemingway’s other haunt, La Bodeguita, but it was easy to get a seat at the bar and to snap a pic of the Ernest Hemingway statue with nobody else in it. I ordered a classic daiquiri and one arrived almost instantly with a side of salted banana chips. Baby, i’m home. The daiquiri production process here is mind blowing. There’s so many being ordered that they’re constantly making them – pouring two bottles of rum into the blender at a time to speed up the process [see video below]. I’ve never seen so much rum (or any liquor for that matter) used anywhere in my life, and I spend a lot of time in bars. They use Havana Club 3, which is probably one of the best light rums you can get (and it’s the real Havana Club, not the American imposter distilled by Bacardi in Puetro Rico then bottled in Florida, ugh), and as I sat there consuming these wonderful beverages for a couple of hours chatting to a Dutch girl and a Canadian dude who were also travelling alone, they must have gone through at least 40 bottles of the stuff. It’s touristy, yes, but in the best possible way, and while you’re sitting there drinking your daiquiris, eating your banana chips and listening to live son music, you do feel like there’s the distinct possibility that it might actually be 1952. Then I took a 9-hour overnight Viazul bus to Camagüey where I spent a couple of days in the city then went up north to the coast at Playa Santa Lucia for a touch of paradise and various other things. I’ll write about them later (or not). Camagüey and Santa Lucia were great, but after all that I was pretty stoked to be back in Havana for one last day. And I think I have my touristing here sussed. Morning activity: weird breakfast, aimless wandering, people watching. Then: lunch and a pint somewhere – today I went to Bosque Bologna on Calle Obispo, which lured me in with its live music and leafy courtyard. I realise that (other than the weird breakfast on day 2) I haven’t really said much about Cuban food. I’d read a lot about the food before I came, and what you read is generally true – the best way of describing it is “notoriously unspectacular, but generally tastes good”. Most standard (affordable) restaurants will serve you some sort of variation on meat/fish with rice and beans. I blooming love rice and beans so I was in for a treat and only vaguely understood where my fellow travellers were coming from when they said they “like totally love Cuba” but “can’t wait to get home for some real food”. Bosque Bologna was more radical and they served me some sorta fish with rice and VEG and it was great – cooked beautifully and seasoned to perfection and what else do you really want, guys? I then returned to one of my favourite places in the whole city – the Hotel Conde de Villanueva. When you walk in the door, go straight through the reception area and you end up in an even more lush and leafy courtyard (the cat is always in the same place, but it’s alive, I checked). It’s ridiculously tranquil in comparison to the streets just outside, and is the perfect place to drink a coffee and read a book – and when you decide you want to smoke some damn cigars because it’s Havana you just go up the green stairs. Up those green stairs is what I think is the best place to buy cigars in all of Havana. They have an unrivalled selection of famous brands, but the best ones are apparently the ones they roll and age themselves. I buy a reasonably fat unmarked number that is apparently one of the house specials and the guy lights it for me with a splint. Cigar burning nicely, and comfortably sunk into a smoking chair, I got talking to an old Norwegian man who spends three months of the year living with his cuban wife and daughter at the other end of the island in the city of Guantanamo (yes, of torture fame). He had just flown in to Havana that morning and was spending the day in “his church” before heading east. He was more than happy to explain to me the secrets of cigar smoking, and pretty pleased to have been a part of the moment I smoked my first Cubana. We also got chatting to a group of men from Hawaii (who had to come via Panama cause USA), and between them they made sure my rum glass was never empty and that I was puffing like a pro by the middle of the afternoon. Then, all too soon, it was time to leave. But not before figuring out that rolling up to the airport in a black 1967 Mercury Cougar with skull door locks and LEDs, stinking of cigars and rum, is legitimately the only way to end your trip to Havana. What’s up with the film camera? Havana is a good place to shoot film. Fits with the retro vibes and all that.